It is little known how essential John has become to keeping our streets clean and presentable. 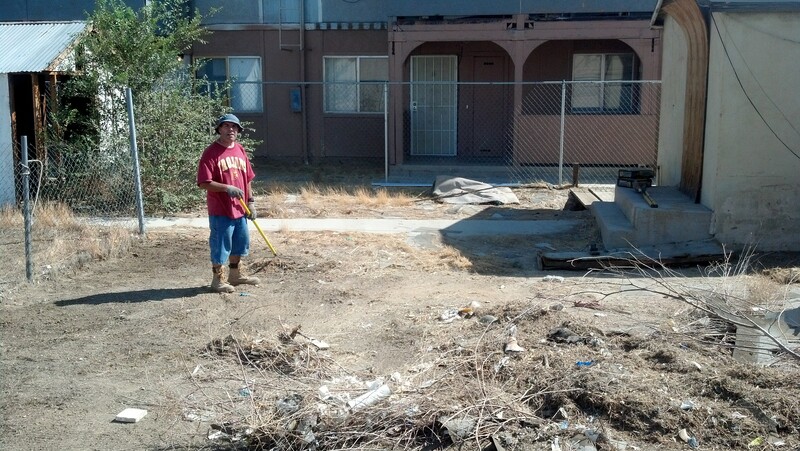 John has personally cleaned up at least 5 lots since May, and his selfless dedication has inspired countless others to do the same. You will probably see John cleaning up around town, and if you do, stop by to say thanks – or even better, hire him to clean up a property that has been bothering YOU! This entry was posted in Beautification, Cleaning up, Uncategorized on September 16, 2013 by mojavefoundation. John is an example of a jewel in the desert – just quietly going about making Mojave a better place to live and asking for nothing in return. If Mojave had such a thing as a “key to the city”, he’d be at the top of the list to get it!